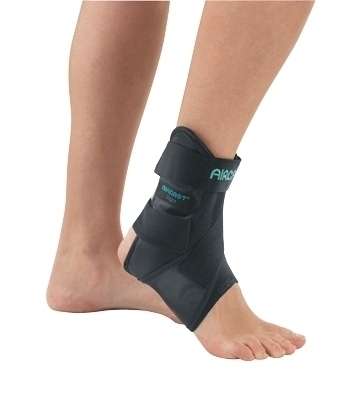 AirSport" ankle brace incorporates clinically proven semi-rigid shell and aircells to provide comfort and support. Additional compression and stabilization is provided by anterior talofibular cross strap and integral forefoot and shin wraps. The unique "step-in" design (toes first inserted into the back of the brace) and automatic heel adjustment make the AirSport extremely fast and easy to put on.